Calling it right now, based on sources. Barack Obama will become the 44th President of the United States. Updates and more information to follow. John McCain ran one of the most ineffectual Presidential Campaigns in American History. Just horrible and embarrassing. Some men aren't cut out to be President, and McCain was certainly one of them. If McCain was a horse, someone would take him out to the back pasture, and put him out of his misery. Here you had Barack Obama, the most socialist, leftist, disingenuous, and deceitful mainstream candidate in American History, and McCain could not put a dent on him. What should have been scandal of the week exposure of Obama by McCain from the beginnings of the campaign, fizzled out to Joe The Plumber having to tell the American people that Obama was a Socialist. 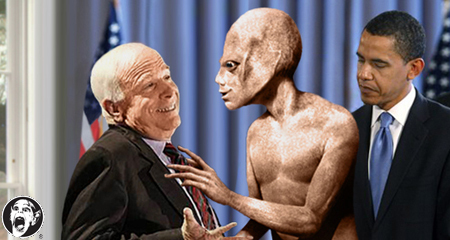 At a recent McCain rally, inside sources say Cindy McCain disappeared with the Alien after sharing several champagnes with the notorious intergalactic lightweight. Ms. McCain’s alien-like good looks and natural blood temperature of 54 degrees Fahrenheit may have proved too much for him to resist as she reportedly put her cyborg husband into sleep mode and worked her charms. John McCain just finished delivering his concession speech. It's the classiest, most gracious concession speech I've ever heard. It was a great speech, well delivered, and sad to hear. If only it was a victory speech. Well, a victory was never meant to be. Certainly, he wasn't helped by the Media, 85 percent of it, which was in the tank for Obama. But truthfully, few liked McCain. People either voted for him, because he wasn't Obama or they were casting their votes for Palin, who ressurected McCain's campaign. That however didn't stop McCain's inept advisors from criticizing her covertly to the Media, including one, who referred to her as a whacko. and McCain in this election cycle. Funniest comment about Obama's victory speech: The Fresh Prince of Bill Ayers?